Today, I found myself in a Bank of America, finishing up what I figured would be a 15 minute job. Sixty minutes later, I was out the door; a new signature card in the system, an additional account added to the DOTC one, new BoA online user account, second ATM card secured and activated, checks ordered. While completing a wire transfer, all my personal information was set up so I would rarely, if ever, need to step foot into another branch again. Taping out on the Droid, registration completed and passage confirmed for the upcoming Preo/HP event in Seattle, DOA procedures outlined and initiated for one of lastweeks installs(I was told that HP's never arrived dead, I was misinformed), client confirmation of delivery and invoicing for 3 Edgelines. All from inside the bank. And did you catch the part about "never needing to step inside a branch, again"? My account costs me nothing, no monthly fee, as long as I use the ATM machine once a month and opt in to email statements - no printed statement. And you've seen the ATMs right? No envelopes for cash or checks; the dang thing reads (scans with OCR) everything. The manager and I strike up a conversation because he notices the name of the business, "TheDeathOfTheCopier". "That's a pretty catchy name. I remember when everybody was selling those things. I had them coming into my office everyday trying to sell me copiers. Don't see those sales people anymore. Is Xerox still around?" Of course, I couldn't hold my tongue, "Yes, Xerox is still around, just different. I noticed you don't have any copiers. And I bet, not that long ago, you had a printer at every desk. Heck, just a few years ago, you probably had more desks and more employees, let alone, more copiers, right?" "Sure did, " he responded. 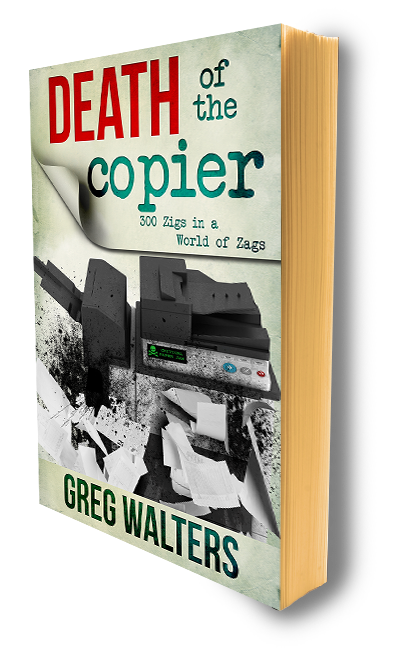 "Yeah, you see, all those copiers, just sorta died, wouldn't you say?" It's everywhere. What we do, touches everything.